We hope you had an enjoyable holiday. This term will be a very busy one as usual and we are looking forward to the visit to the National Space Centre on Tuesday 29th January. Please support your child with their homework and check that it is completed and returned to school, when required, as this will help the children practise and reinforce the learning they have been doing in school. It is vital that your child reads whenever possible and if you have time, please ask your child questions about the book or text they are reading to help develop their comprehension and vocabulary. Your child should be reading at least 5 times a week and these should be recorded in their reading record. Spellings are given out to the children (usually on a Friday) and the children are expected to use their spellings in sentences to show they understand the meaning. You can also support your child by helping them learn their times tables and other maths facts. On this website there are maths and reading activities set up for your child to access at home or a local library. Children should be using this resource regularly as part of their homework. This half term we will be working on the topic Space: Earth, Moon and Sun while also continuing to develop skills and knowledge in other subject areas. After half term, we will be finding out about World War 2. Below is a table showing what we will be covering with the children. Diary writing about seeing a U.F.O. Story writing based on the book ‘Tales from Outer Space’ by Shaun Tan. Explanations and instructions about futuristic technology. Letter writing based on the book ‘Goodnight Mister Tom’ by Michelle Magorian. Poetry based on the work of Michael Rosen and Roger McGough. Comprehension skills including retrieval, inference, deduction and explanations – finding evidence in the text for their answers. We will also look at the difference between fact and opinion and getting the pupils to predict what might happen in the texts they read. Adverbials of time, space and number. Using commas correctly to separate adverbials, to create lists and to separate clauses. Expanded noun phrases and modal verbs. Punctuation required when writing speech and using colons, semi-colons, brackets, dashes, hyphens and commas for parenthesis. The ei and ie rule, words ending in ence, ency, tious, ent, and ant. We will also look at some of the statutory words for year 5 and 6. Place value and negative numbers. Fractions: comparing them, finding equivalent fractions, simplifying fractions, adding and subtracting fractions and changing improper fractions into mixed numbers and vica versa. Multiplying and dividing fractions. Rounding numbers to the nearest 10,100,1000,10,000, and 100,000. Adding decimals and multiplying and dividing decimals by 10,100, and 1000. Coordinates: being able to translate a shape and read coordinates. To continue to practise and develop written methods for all operations: addition, subtraction, multiplication and division. To know that the Sun, Earth and the Moon are approximately spherical. Finding out about the orbit of the Moon and Earth and how the Earth and other planets move in relation to the Sun. To use the idea of the Earth’s rotation to explain day and night and the apparent movement of the sun across the sky. To describe the difference in the life cycles of a mammal, an amphibian, an insect and a bird. To describe the life process of reproduction in some plants and animals. To use the computer to find out about planets and life in World War 2. To use ‘Sketch Up’ to design buildings. Be able to use and interpret globes and maps. To know the position of the Equator, the Northern and Southern Hemispheres and understand the terms longitude and latitude. To be able to use the points of a compass to explain location of places. To understand the significance of the position of the Arctic and Antarctic circles and how it impacts on the life that lives there. To understand the reasons for WW2 and know which countries were involved. To find out about life as an evacuee. To find out about rationing and the food people ate during the war. To find out about the role of women during the war and how war changed their roles. To know what a soldier would wear and what he would carry. To know about the Battle of Britain. Working with different mediums (pencil. colouring pencils, pastels and paints) to create art work based on the cityscapes of Claude Monet and to create work based on the topic of Earth, Moon and Sun. To create posters related to World War 2. To identify places which may be special to different people and reflect on why these places are special. Look at different pilgrimages such as those to Lourdes, Jerusalem, Amritsar in India, and Mecca. To set challenges and goals for the future. This will be taught by the Luton Music service after half term. If you have any questions or concerns about your child’s progress or the topics they are learning, please do not hesitate to contact your child’s teacher so an appointment can be made. Welcome back! We hope you had a wonderful summer holiday and that the children have already begun to tell you some of the great things we have planned to do this term. We’re really looking forward to meeting you all and will hopefully do so over the next couple of weeks. Within this curriculum letter, you will find an overview of the things that we will be covering in our learning this term. We hope that you find this informative. When children enter Year 5, many parents decide to allow their child to walk home by themselves. If you wish to do so, please inform your child’s class teacher in writing. If we do not receive permission in writing, we will not allow your child to leave the school premises without an appropriate adult. In year 5, our PE day is on Monday and the children will need to come to school in their appropriate PE kits and will stay in their kit for the day. For indoor PE, the children need black shorts and a plain white t shirt. In the colder weather, dark coloured plain tracksuits/jogging bottoms are suitable for outdoor games and appropriate footwear is essential. These can be worn over the top of their shorts on the way to school when the children are having indoor PE. On alternative Fridays, the children will participate in swimming sessions. The children will need to ensure they have a towel and a suitable swimming costume on the day they go swimming. It is also requested that girls wear a swimming cap. Please also note that if a boy wears long ‘Bermuda’ style baggy shorts the swimming teachers will not allow them to take part due to health and safety so it is suggested that boys wear swimming trunks. Please make sure that children do not wear jewellery to school, earrings are removed and long hair is tied back on these days. Year 5 is having a big focus on reading this term. Children are expected to read with an adult for 15 minutes at least 4 times a week. This needs to be evidenced in their reading records with a comment from you. You do not need to wait until a book has been finished before you write a comment. Please comment every time you hear your child read, however many pages this may be, so we can keep a record of how often your child is reading. We expect children to have their reading book in school every day. In addition to a reading book, children will have the opportunity to visit the school library once a week to select a book of their own choice. We would like to remind you a fee will need to be paid to replace any lost books. Your child will also have a Bug Club password and have books allocated for them to read. As your child enters year 5, expectations will be raised. The format of your child’s home learning will be different to what they have been used to previously. As well as the usual Learning log, they will also be set Maths homework and weekly spellings. Learning Log homework will begin on Friday 14th September. Learning logs will be sent out on Friday and will need to be returned by the following Wednesday. There will only be one learning log objective based on the topic that children have been learning that week. However, as part of the task, there will be an English focus, which will depend on your child’s set. Maths homework will be set by your child’s set teacher and will vary amongst classes and groups. The homework set will reinforce work which the children have been working on that particular week. It is important that children practise their times tables as an ongoing task. This is an important skill they need to have as so much of their mathematical learning in years 5 is based upon these. Spellings will be set on a Friday to be returned and tested the following Friday. As well as practising each spelling on a daily basis, children will need to write sentences to demonstrate their understanding of each word. All of the tasks set are very important in bridging relationships between home and school. They are designed to build on the skills and knowledge that they have been developing not only throughout each week but throughout the school year. If you have any questions please speak to your child’s class teacher. A homework timetable will shortly be sent out to you. As in all key stage 2 classes, children will have the opportunity to have a healthy morning snack. As a school, we endeavour to promote healthy lifestyles so we ask that children bring in a piece of fresh fruit, vegetables, some dried fruit or a cereal bar as their snack choice. Please do not send any snacks which contain nuts as we have some children in this year group who have a sever allergy to them. 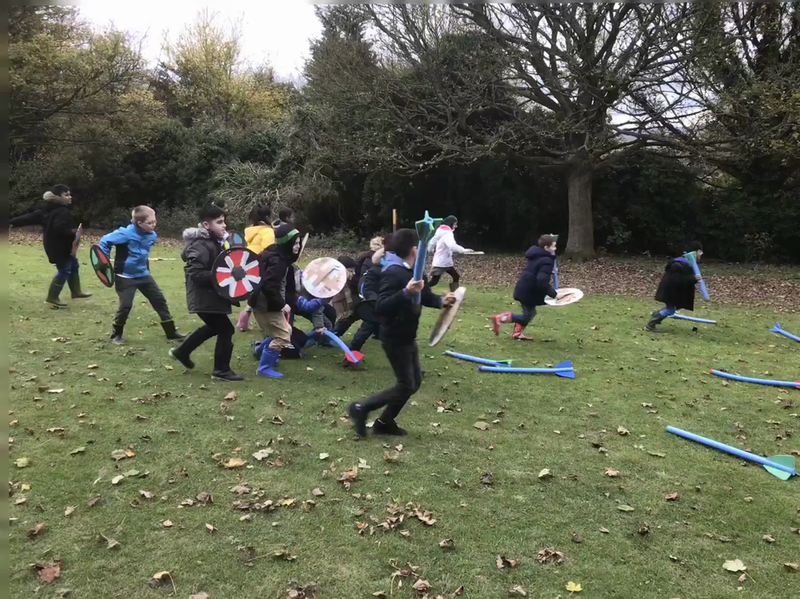 During this term we will be visiting Dell Farm to take part in a fun and engaging day based on our topic of Anglo-Saxons and there is also a trip to see a pantomime during December. More information about these visits will be sent out to you in due course. If your child requires an inhaler, insulin or an Epipen please could you ensure that these are in school and are in date. If your child has any new medical conditions (including allergies) then please contact the school office to inform them of any treatment or medicine that is required. The year group will continue to take part in this exciting award on alternate Fridays. On this day they will be required to wear their Prince William uniform which school will provide for them. During this half term, we will be holding a meeting for parents with children in Year 5. During this meeting we will explain the expectations of the year 5 curriculum and ways that you can support your child at home. A date will be set soon and you will be notified shortly. We look forward to seeing you there. In English, this term we will be looking at the following genres of writing; narrative, recounts, character descriptions and development and letter writing. We will also be completing a unit of work based on a novel each half term. In Reading Comprehension, we will be focussing on the skills of inference and deduction as well as increasing our vocabulary by looking at a wide range of texts. In Spelling, we will be focussing on specific spelling patterns as well as looking at suffixes and how they change the root word. In Grammar, we will be looking at improving our sentences to make them more detailed, developing the use of different conjunctions and adding adverbials. We will be building our understanding of more complex sentences as well. In Maths, there will a focus on securing the mental and written methods for the four operations; addition, subtraction, multiplication and division. We will then look at applying this knowledge to help us solve word problems involving two or more steps. We will also continue to develop their understanding of fractions, decimals and percentages in some sets. Aside from numbers, we will be looking at 2D and 3D shapes, identifying their properties and working up to find missing lengths and angles. We will also continue to develop understanding of measures such as time and length. In Science, we will begin the year by investigating a selection of innovative and ground breaking scientists. After half term we will be developing our understanding of what forces are and how they affect us in our everyday life, especially gravity, friction, air resistance and up thrust. Our topic for this term is the Anglo Saxons. This topic will include learning throughout different areas of the curriculum including History, Geography, Art and Design and Technology. We will start by finding out about the geography and landscape of the United Kingdom and Great Britain and making comparisons between the UK now and in Anglo Saxon times. 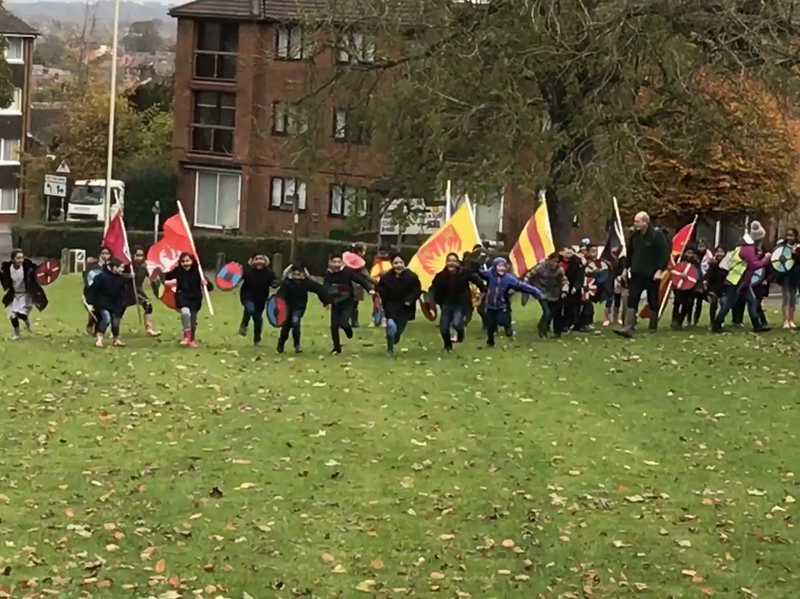 There will be a focus on natural features and the importance that they play, the geography of counties, cities and towns and linking these to the history of Britain. We will be investigating invasions of Britain, settlements, beliefs and cultures, as well as Anglo Saxon stories, art, technology and famous monarch. Design Technology will be linked to our work in History on the Anglo- Saxons. Children will work creatively to replicate Anglo Saxon artefacts and create models of what a typical settlement may look like. In P.E we will be concentrating on team sports. Children will be developing new skills in football. Indoor P.E this term will be dance. In PSHE, we will focussing on new beginnings where the children will be thinking about, discussing and generating ideas about how to manage in new situations, as well as feeling valued as part of our school community. We will be finding out more about growth mind set and how this can help us to become better learners. Children will be discussing the value of friendship and team work, where children will work together, using cooperation and communication skills to be successful in a range of tasks. This term will be learning about a range or inspirational leaders and what it means to be a good leader. We will also be looking at who inspires us. In music this term we will be exploring rhythm and pulse as well as exploring rounds. In French, we will be learning the days of the week, months, times of day, the date and weather, seasons, hobbies as well as revision of numbers and colours. Your support is much appreciated and please remember that you can make an appointment with us should you have any questions or concerns that you wish to discuss. For English and Maths we are also joined by Mr Salisbury and Mrs Culley. We try to create an interesting and immersive curriculum where our topics and core subjects are linked in an overarching theme each term. We use most curriculum lessons to further develop children’s understanding and enjoyment of these topics throughout the term. Starting in Spring Term, Mr Cowburn will be returning to continue the fantastic music lessons that the children have had with him in previous years. 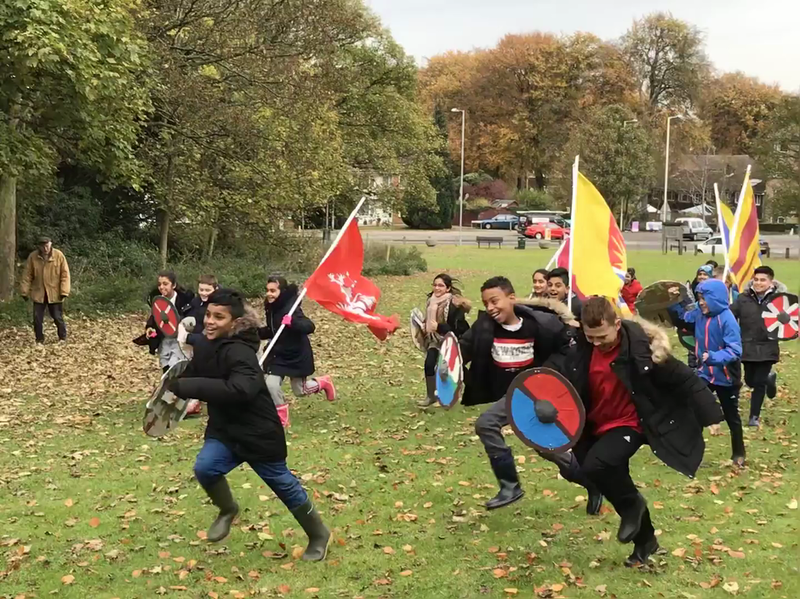 Year 5 have a visit to Dell Farm in November to experience an Anglo-Saxon themed day, linking to our Autumn term topic. In the Spring term, we learn all about space. We visit the National Space centre in Leicester to help consolidate learning and bring the topic to life. There will also be a residential visit to Dell Farm at some point this term. In the Summer term, we return to Dell Farm, to complete scientific experiments linked to our science lessons and take part in outdoor adventurous activities. In Year 5, we have high expectations of our children. We promote the school’s values and encourage children to think in a growth mind set. Children are expected to read with an adult for 20 minutes at least 3 times a week. This needs to be evidenced in their reading records with a comment from you. You do not need to wait until a book has been finished before you write a comment. Please comment every time you hear your child read, however many pages this may be, so we can keep a record of how often your child is reading. We expect children to have their reading book in school every day. In addition to a reading book, children will have the opportunity to visit the school library on a weekly basis to select a book of their own choice. Our library day is Wednesday. Our PE days are on Monday and Friday. plimsols for indoor PE and trainers for outdoor PE. Learning logs will be sent out on Friday and will need to be returned by the following Wednesday. There will only be one learning log objective based on the topic that children have been learning that week. However there will be an English focus, which will depend on your child’s set. Maths homework will be set by your child’s set teacher and will vary amongst groups. The homework set will reinforce work which the children have been working on that particular week. It is important that children practise their times tables as an ongoing task as this is an important skill they need to have as so much of their mathematical learning in Year 5 is based upon these. How the Saxons lost the Battle of Hastings, they broke their shield wall and ran after the Normans.